Public preschool enrollment increased at similar rates for children with different levels of maternal education. Over this time period, there was an increase in participation in public preschool of between 8 and 12 percentage points for each of the maternal education categories as shown in Figure 23 ( marginally significant for children of mothers with less than a high school diploma; significant for all other maternal education subgroups). Children of mothers with education levels below a bachelor’s degree had similar levels of public preschool enrollment, and those rates increased from around 20 percent in 1995 to around 30 percent in 2011. Children of mothers with a bachelor’s degree or higher had consistently lower levels of public preschool enrollment. Private preschool participation, on the other hand, was lower at each successively lower level of maternal education, with the exception that there was no difference between associate’s degree and some college (Figure 24). It could be that declining earnings at declining levels of education made families with lower levels of education unable to afford or use private preschool or that mothers with higher levels of education were willing to pay more for their children’s private preschool. 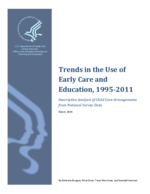 While public preschool enrollment increased, there was a decline in private preschool enrollment that occurred for all groups between 1995 and 2011 except for mothers with less than a high school diploma; this group had consistently low levels of private preschool enrollment over time.